It started off kinda quiet, with about 20 people around at 1pm. As anybody who follows me on twitter or Facebook or gchat or AIM or MSN (or talks to me in real life, but who does that if they can just talk to me on the internets?) could probably guess by now, I’m pretty pleased with the recent article in the New York Times on my favorite up-and-coming eSports phenomenon – the Collegiate StarLeague (CSL). The CSL, which is the brainchild of Mona “Hazel” Zhang (recent second-place winner in the SC2GG Commentator Idol), a freshman at Princeton University, recently held a showmatch between the Princeton CSL team and a StarCraft team at Qinghua University in China. Qinghua is a pretty big name – think of it as the Yale of China to Beijing University’s Harvard. I’m not sure how they organized the showmatch, which was broadcast semi-live off of replays by Cholera on ustream, but I’m sure Hazel has friends there or something. 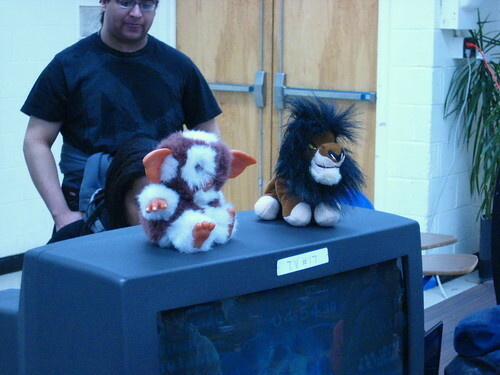 Anyway, the Princeton folks took it upon themselves to make the showmatch into a spectator event – they found space in a building on campus and had a projector showing the games on a screen with commentators sitting in front of the audience MSL-style. I saw this little gem of an article a few days ago (actually it was pointed out to me by several people), and I’m pretty irate about it. Let’s go through the reasons why this is terrible reporting, shall we? First the nitty-gritty, and then the more substantial philosophical bits. First off, the title: “Virtual Leagues Fold, Forcing Gamers to Find Actual Jobs.” This sounds like something out of The Onion. “Actual jobs”? Would they say that if the NFL folded suddenly and a linebacker for the Dallas Cowboys had to work in an electronics factory to bring home the bacon? Would they say that if the World Series of Poker folded and some mustachioed straight-faced card shark had to start selling Xerox machines for a living? Why this implication that professional video game players create nothing of cultural or economic value when they ply their trade? Are gamers somehow cheating the American people out of their hard-earned dollars by getting paid to do something they’re good at? At the beginning of the tournament (or a couple hours into it, since Kwan and I arrived around 1:30) there were TONS of people. Mostly brawlers. This past weekend I hung out at the G.I.M.P.E.D. 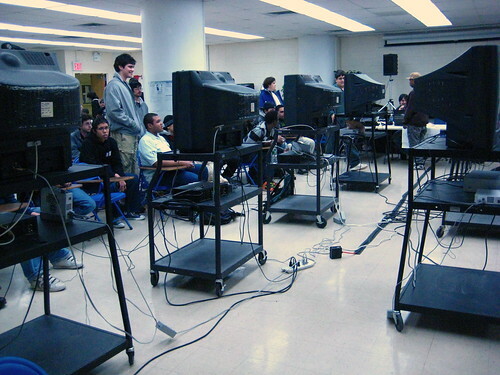 1 melee/brawl tournament at NYU Polytechnic in New York City, not as a competitor but as a photographer, journalist, and eSports scene analyst. While I’m very interested in the Smash scene, I’m primarily associated with the StarCraft community, and therefore it may not be surprising that the number of tournaments I’ve attended in person in the States is different for each game. What may be surprising is which number is higher: I’ve been to three live Smash tournaments so far and only two StarCraft ones. If I’m so obsessed with StarCraft and getting involved in the SC scene, why is this the case? There’s a lot of factors which influence the situation, and none more salient than the nature of the two platforms themselves, and how such fundamental differences affect the purposes of the live events they inspire. The most striking thing to me, though, was the fact that the tournament wasn’t really about having a tournament. Sure, there was money and glory on the line, but it was obvious that the primary purpose of the tournament was to serve as a social gathering. 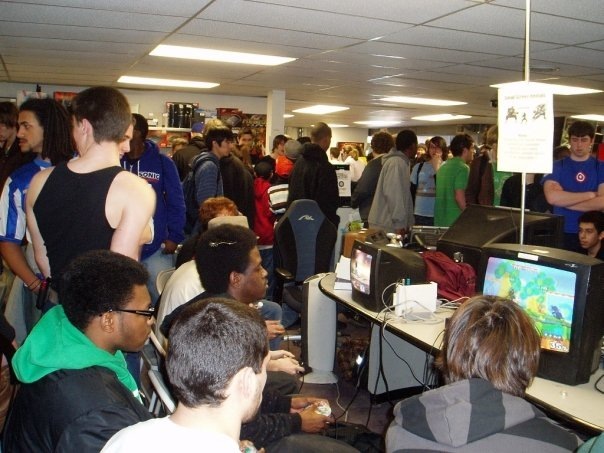 People went there to hang out with their friends and play each other in Smash – to spend an afternoon away from the daily grind of work and school and immerse themselves in a social world centered around playing a game. There was no distinction between players and spectators, except possibly for me, since I was one of the only people (if not the only person) who didn’t play at all during the four or so hours I was there. Calling it a “tournament” seemed like a misnomer or a clever cover-up for something much more genial and community-oriented than competitive. The “stars” who were there were not treated differently from other people from a social perspective, although they were somewhat limited in the people they chose to play friendlies with (due to playing ability, I’d guess). This is not the case at all for major StarCraft tournaments (except for those in Southern California), and to a lesser extent for PC game tournaments in general. 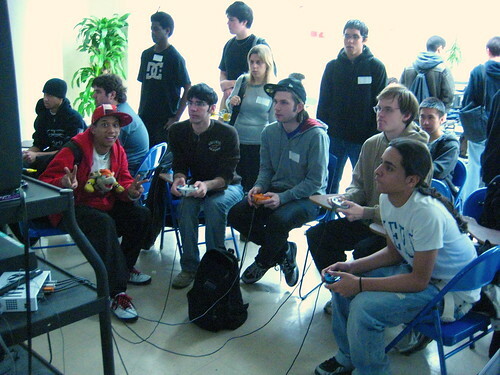 Although it’s possible to play Brawl online, there’s always the issue of lag and the impossibility of playing Melee online which encourage the live tournament scene. In StarCraft and other competitive PC games that aren’t heavily team-based, 90% of the tournaments that happen occur online. 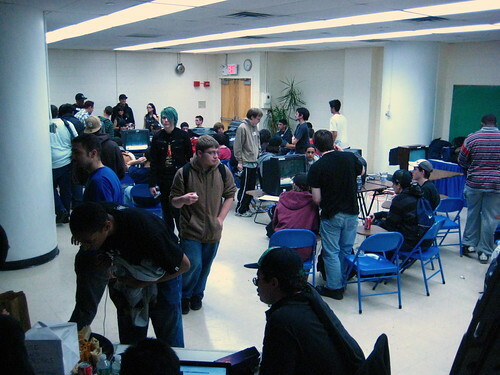 This means that there tend to be very few offline tournaments, since the hassles of bringing equipment or finding a computer lab and other hardware problems make organizing a live tournament rather unappetizing. It’s so easy to figure out brackets on iCCup and have a tournament online in one afternoon – as long as everyone shows up – that calling for an offline tournament has to offer other advantages than just being able to compete. If you’re just trying to find out who’ll get the money and the glory, why not choose a venue where the setup costs are minimal to none and participation is open to people around the world instead of just those within a 50 mile radius? It certainly makes for a higher level of play, overall, and with YouTube and live streaming anybody can see the games as they are happening or afterwards (not that this doesn’t also happen with Smash, although I think to a lesser extent). Additionally, there’s the money issue. People in Smash are used to paying a small fee upfront to participate in a tournament, and that money is used for both venue fees and prizes. The same is not true for StarCraft tournaments unless the potential for fame and prize money is huge. 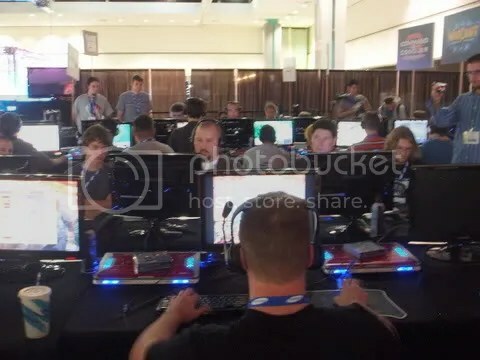 After all, it’s free to play online and tournament administration online is usually the same or even better than administration at live events. Essentially, StarCraft live (or “offline”) tournaments in the States fall into two categories: small events on college campuses or large, expensive events with potential for national exposure (not the Janet Jackson Superbowl kind). Inevitably, only the latter tend to involve cash prizes. So what happens at a big StarCraft tournament where the stakes are higher and the trappings are glitzier? Well, in comparison to the way Smash tournaments seem to blur the line between competitors and spectators during competition, at SC tournaments there’s a very clear separation. There is tension in the air and there is silence during tournament matches. People often come just to watch. The socializing largely happens at times and places separated from the tournament itself. What sort of consequences do these differences create for the larger online community? Well, it certainly means that “amateurs” are more likely to compete in live events alongside those at a “pro” skill level in Smash. It seems the Smash scene is separated more along geographic lines than skill lines for reasons of practicality – it’s hard to get across the country or the world to play melee friendlies. High-level StarCraft players, on the other hand, compete against similarly-minded folks from any number of different countries or regions. 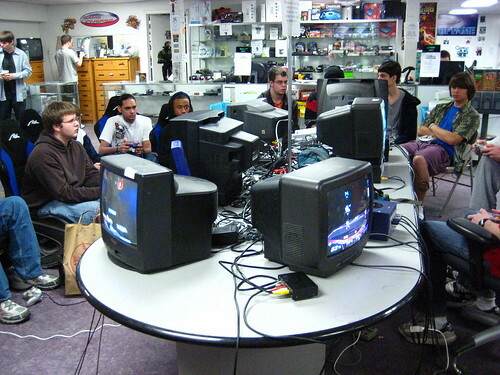 International Smash tournaments are fairly rare, but for StarCraft it’s practically normal. It also means that Smash players have more opportunities to bond in-person with other players and become “real life” friends. I haven’t researched the language on Smashboard posts extensively, but it’s probably the case that Smash people are nicer to each other than StarCraft people because they often actually encounter each other face to face. The anonymity of online play and interaction often encourages pretty offensive behavior from StarCraft enthusiasts above and beyond your friendly trash-talk. 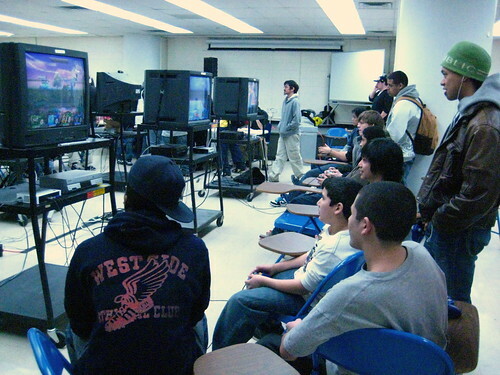 However, the regionalism of Smash is a double-edged sword – it promotes an enormous amount of community, but if you happen to live in an area without many Smashers around you have little opportunity to hone your skills to a highly-competitive level. In the end, both scenes have their advantages and disadvantages. Smash players may get to play in more tournaments and win more money overall, but StarCraft players can practice at a high level much more frequently even if the matches aren’t of very much consequence in terms of “rankings” (iCCup aside). 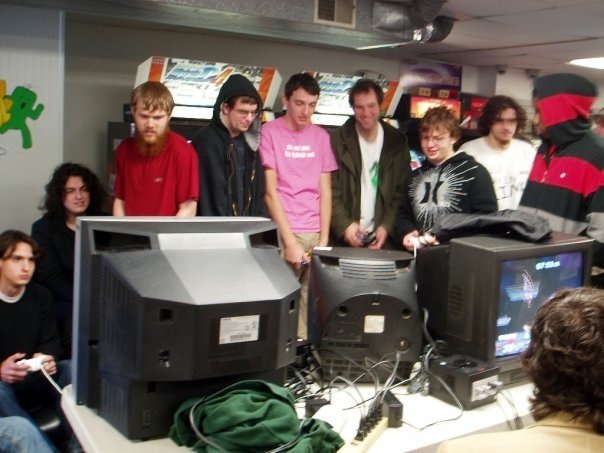 The StarCraft community is cohesive across geographic boundaries of state and country, but the Smash community is more likely to produce friendly interaction unrelated to the game itself and/or face-to-face. Smash’s vibrant offline culture is a fascinating counterpoint to StarCraft’s intense online fan-based culture. I consider myself very lucky in that I get to experience both worlds although I don’t play competitively (that is, in tournaments) in either game. The moral of the story is that gaming communities are not all alike and cannot be considered as such when talking about building or expanding a competitive scene. People also shouldn’t judge other gaming communities as better or worse than their own without understanding the whole story and why the community dynamics are the way they are. At heart, we’re all gamers, but everything else is up for debate – and I find that kind of diversity beautiful. Thanks for reading, and please leave some feedback! 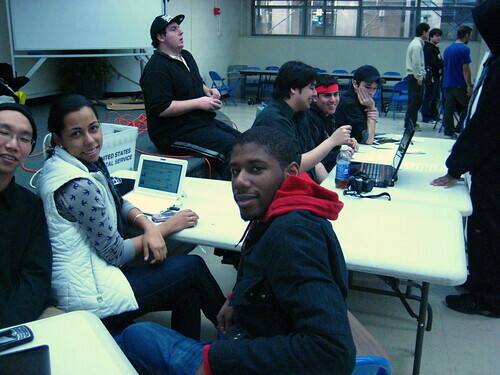 This weekend I thought “to hell with school, I’ll go down to NYC and check out this awesome smash tournament!” Props to KnightMare and the NYU Poly gaming club PAGE for organizing the event. Check out the results thread to see how it all panned out! Author ChristinaPosted on February 23, 2009 February 29, 2016 Categories SmashboardsLeave a comment on G.I.M.P.E.D. in NYC!